Almost everyone knows someone that has experienced difficultly sleeping. The Frequent Sleep™ Band is based on the same frequency principle as the B.E.A.M.™ products…when worn on your wrist, the frequency resonates throughout your system…the only difference is that the Frequent Sleep™ Band is imprinted with a lower frequency, the frequency of sleep, that gently assists the body to relax and fall into a deep sleep. This gentle relaxation occurs within the first 5-10 minutes of putting the Frequent Sleep™ Band on your wrist, and usually is noticed first through the shoulders and neck and after that most don’t notice anything because they are asleep. No drugs. No pills. Just sleep. I have been taking sleeping aide medications for years. 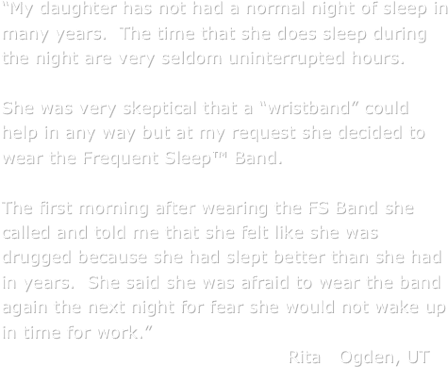 The Frequent Sleep™ Band was a new concept to me but I was willing to try anything. 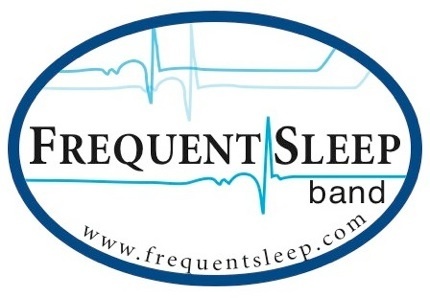 My first time experiencing the Frequent Sleep™ Band was on a long flight across the country, I have never been able to sleep on a flight, so I thought this would be a great test. After they served us our “meal”, I put the FS Band on, as instructed, and the next thing I know the pilot is announcing our descent into JFK. I had slept nearly the entire flight! I felt a little drowzy but refreshed. I took good care to put the FS Band in my purse so I wouldn’t lose it! I told my partner what had happened and he suggested that it might have been because the flight was a red eye. Although I had never been able to sleep on an airplane before, it made sense that the FS Band might have been less a factor than I had previously concluded. So that night my partner decided that it would be good for him to test the FS Band. He put the band on and within 15 minutes he was asleep and didn’t wake up until his alarm went off the next morning. A good night’s sleep was not unusual for my partner but he never remembers dreaming…the night he wore the FS Band he dreamed vivid dreams and felt very rejuvenated in the morning. I no longer let him wear my FS Band because I am getting much more sleep with it these days. I rarely have to take medications to help me fall asleep and I feel much more rested in the morning. We can’t wait until the product is ready in November! Thank you! I have experienced sleep depravation for much of my adult life. I simply cannot stay asleep. Especially when there is a full moon, the sleep I get on and off through the night, added up, is about 2 hours. For the first time in years, with the Frequent Sleep™ Band, I slept 6 hours and it was the night of a full moon. I got up once to use the restroom and was able to go right back to sleep! I feel so much better because I am getting good nights of sleep.